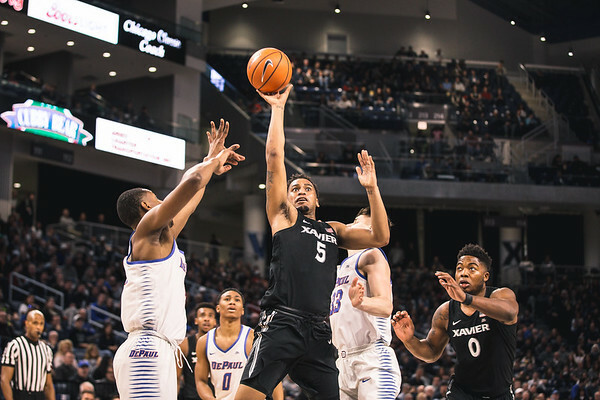 Saturday I was in Chicago to photograph Xavier as they tried to claim the outright Big East conference title. I had not seen the Musketeers in person since they played at Marquette at the end of the year. That was a great trip and a great game. This is a fun team to watch play basketball. After the game I thought that something might happen in the locker room, but I was not prepared for the water that ended up in the air. The TV interview for Coach Mack gave the team enough time to come up with the water plan. I knew that I (and my equipment) would get drenched so I ditched one camera and rolled the dice with the other one. It was well worth it as I made one of my favorite pictures from a fun weekend in the locker room. I really liked the photo that I made with my 11-24mm lens the night before during the anthem, but I didn’t feel that I nailed it. 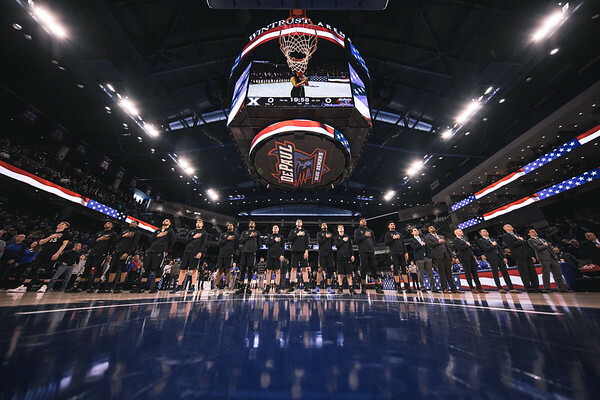 The cool scoreboard of Wintrust Arena gave me a chance to redeem myself a few short hours later. I really like the way that this one came out. Maybe I will get a chance to do this again during the big dance. 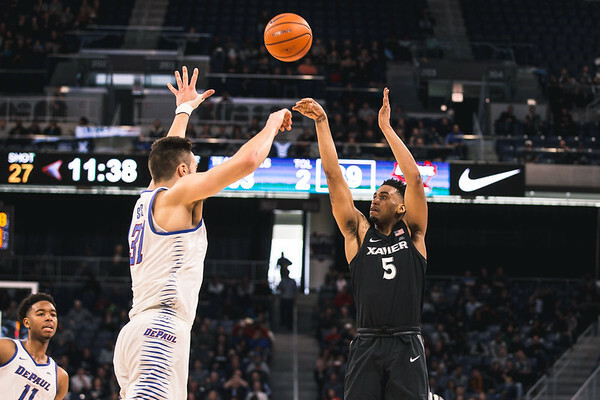 Saturday Trevon Bluiett set the Xavier record for career three pointers. He really is a fun player to watch, and I was glad to get the chance to photograph him playing again. He really is a dynamic player that is not done doing big things. When I got back to my hotel Friday night in St. Louis I knew that I had only a short time before I had to be in Chicago. An 11 am start comes quickly. I was a little tired, but the photos that I made were completely worth it. I never dreamt that Indiana State would lose, and I would have to make that road trip up north. Every story has a bright side though, and even though I was bummed for Indiana State I was happy to have a fun day with Xavier ahead of me. 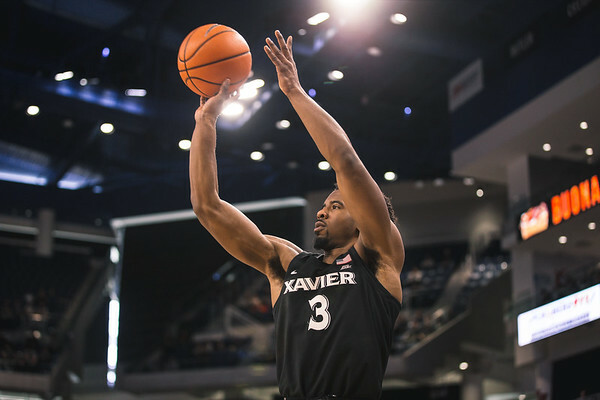 My basketball season really started early with shooting Musketeer Madness for Xavier in October. With no more basketball on the books this could have been the last time that I make images for the season. With tournaments coming up that could all change, but if it does not this was a cool way to bookend the season. 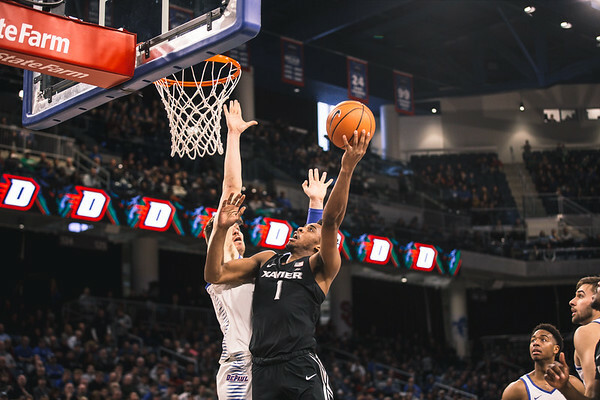 I started it photographing the men’s and women’s teams for Xavier in Cincinnati, and it may have ended with both teams in Chicago. That is pretty cool if you ask me. Last week was another fun and rewarding week making images. This is a weird time of the year because I am at the end of basketball season and baseball is starting. I want baseball season to get here so bad, but this is the best time of year to photograph basketball. The emotion really comes out naturally as more is on the line. This was the most fun that I have ever had during a season photographing basketball. This week is part of the that reason why. Take a look at my favorite photos from last week here.